The Mustang GT. Ford's better idea. There may only be one thing better than a Ford Mustang and that's a Mustang GT. Believe it or not, the very first Mustang to wear the GT logo was produced late in the 1965 model year. So if someone says they have a 1964 1/2 Ford Mustang GT for sale, I'd start running... away. What's so special about the GT? For your money you got top of the line performance, improvements in handling, traction and styling. The 1965 Ford Mustang, already blessed with a great power to weight ratio (approx. 11.9 lbs/hp) was already a great base. But like all other production cars, it was a compromise between comfort, fuel economy and all out performance. But if you were the kind of person who was prepared to accept a little less cushy ride and smoothness, a lot more fun could be had behind the wheel. Not only that. Back then, Ford, like the other big automakers was heavily into factory racing, as a means to sell cars. Their adage was "Race on Sunday and sell on Monday". Enter Carroll Shelby. Long time multiple class winning racer, race driving school owner and race winning car builder. Who better than to Make the Mustang name as well known in racing as it was becoming on the streets of the world. Shelby took the new fastback Mustang with its 289 cubic inch V8 engine and using tried and true hot rod techniques, turned a good street car into a ferocious one which was called the Shelby GT350 Mustang. But there was another lower priced Grand Touring option for the high performance Mustang enthusiast. At the same time, Ford was creating an optional sport package, which was called the "GT Equipment Group"and was first offered to buyers on April 17,1965. While the new Mustang GT350 was not the new GT option package, the potential confusion may have helped Ford's efforts to market the optional GT package. The new GT, which was available in all body styles, featured special GT badges, special body stripes and a GT logo gas cap. The GT interior had only one notable change, which was the addition of a 140 mph speedometer inside a 5 gauge instrument cluster. The GT engine was a 4 barrel version of the new 289 V8 and exhaust gasses flowed out of a dual exhaust system crowned with chrome "trumpets" which exited the rear valance. 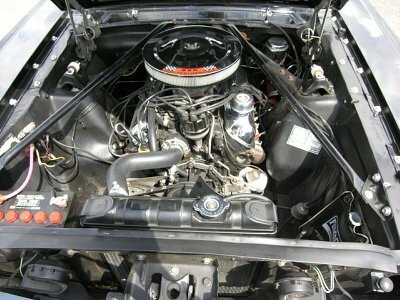 Also available was an optional High performance 289 V8 which produced 271 horsepower out of its high compression engine. Included in the GT package was a quicker steering ratio, coupled to a heavy duty suspension with a thicker sway bar for better handling. The GT equipment group for the 66 Mustang continued to be a popular choice for enthusiasts. The added exterior appeal and increased performance and handling was a bargain at only $152. Although, the basics of the components remained relatively unchanged, the combination of the new for 1966 interior and exterior styling produced a good looking and great performing car. The option certainly appealed to Mustang enthusiasts and over 26,000 cars were delivered with the option. Most distinctive, were a restyled gas cap and a modified grille. The 1967 Mustang received major restyling and added weight. To aid Ford's Muscle Car war, a new "big block" engine was added. This new 390 cubic inch engine, when added to the GT Package, was called the GT390 and provided stump pulling performance. Also available was the 289 high performance engine. Coupled to these packages, were a new quad tip exhaust and power assist, to help haul down the heavier and high performance new car. 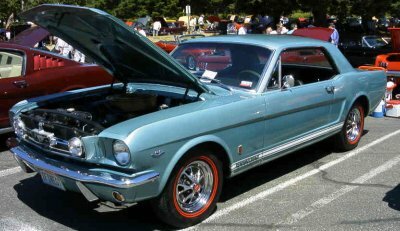 The 1968 Mustang GT included a few new cosmetic changes, such as a redesigned stripe, new styled steel wheels and fog lamps placed inside the grille area. The bigger news, was the availability of the new 428 cubic inch Cobra Jet available as an additional cost option if you ticked the GT box. The biggest change to the 1969 GT was the introduction of a competitor withing the Mustang family, called the Mach l.
Unfortunately, it's distinctive graphics, combined with virtually every option available in the GT package served to reduce demand drastically and only 5,396 of the cars were sold. After a hiatus from the Mustang ll of 1974-1978, the new Fox Body Mustang emerged, bringing back much of the classic Mustang appeal, and the resurgence of horsepower. The 1982 Mustang brought back the GT option, in the form of the new 157 horsepower 5.0 liter V8. Also like its predecessors, these new Mustangs included exterior refinements, such as a new front air dam, rear deck lid spoiler, aluminum wheels and a non functional hood scoop coupled with a blackout trim treatment. The blackout trim continued into the interior, covering the dash and various other areas, and added supportive Recaro seats and a four spoke steering wheel. Popularity remained strong and 1983 saw a total of 27,649 Mustang GT's produced, including 1,000 convertibles. Power choices included the very popular 5.0 V8 with power upped to 175 horsepower. Also available was the small but powerful 2.3 liter turbocharged 4 cylinder engine. The 1984 Ford Mustang GT became even more popular, selling 32,914 units, with over 6,000 convertibles included in the mix. As a result of reliability issues, Ford discontinues the 2.3 liter turbo and bumps up power in the 5.0 liter V8 to 175 horsepower and over 210 horsepower for the high output engine. Although power dropped briefly in 1986, due to adjustments in emission control laws, performance was on its way up and sales remained high, with GT Mustangs accounting for 25% of all units sold. 1989 Saw over 59,000 units sold, yet pressures on the GT package came in the form of the new Mustang LX, which offered all the performance at a lower price. 1990 Mustang GT's sales dropped to 32,000 units with LX models again featuring prominently. Power for both years remained at a respectable 225 horsepower. 1991 Saw a freshening up of the exterior, yet sales continued to drop to just 24,428. Bigger wheels and tires were featured, mated to Goodyear Gatorbacks for improved handling. 1992 cars were virtually unchanged from the previous year and sales were again declining. The last year of the Fox Body Mustang saw not only a decrease in sales, but a decrease in horsepower. Still, for a 10 year run, the Mustang GT was still very successful at bringing back the Mustang enthusiast and re establishing pony cars with enthusiasts.